Small Works exhibits are on the horizon and besides my plein air paintings to choose from I like to use these shows as an opportunity to try out new approaches and ideas. We have been having some beautiful evenings with color saturated atmosphere almost too intense to make a good painting. I decided to attempt a painting where I pushed the color as close to what I was experiencing as I could without becoming garish. It is not as easy as you think. I suppose for some I have already pushed it too far. In any case I am pleased with this little painting of one of my favorite views. I am looking across the Potomac from a boat house on the DC shore to Rosslyn Virginia on the other side. Long time readers will recognize this scene as I have painted it several times in different seasons. I have to say that September is the month that provides the most memorable moments for me there. I have been asked whether or not I tone my canvases and if so, what color do I prefer. The answer is yes, I prefer to paint on toned canvas or panels but I do paint on white when I am doing a very high key painting. I tend not to do many of them as you probably already know. The color I use depends on the weather, time of year or just plain whim. When painting evening/nocturne paintings I tend to use ochre mixed with a bit of purple to dull the yellow a little. Actually, the three colors I use in various combinations are ultramarine blue, alizarin crimson and yellow ochre. The painting above was painted on a mauve color created by a combination of those three colors. For bright day paintings, particularly in the summer, I use just a wash of cadmium orange on the white panel. I let some of it show through to enhance the feeling of sunlight. It is fun to experiment with underpaintings! 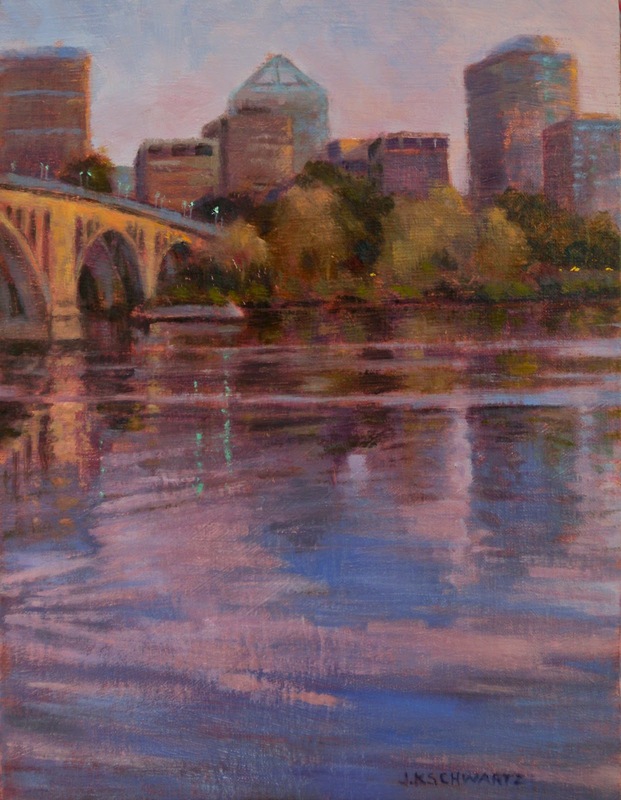 "September Evening, Rosslyn" is one of four paintings I will have on exhibit at American Paintings Fine Art for the annual Small Treasures there. I will announce dates soon and will post the pieces I will exhibit. 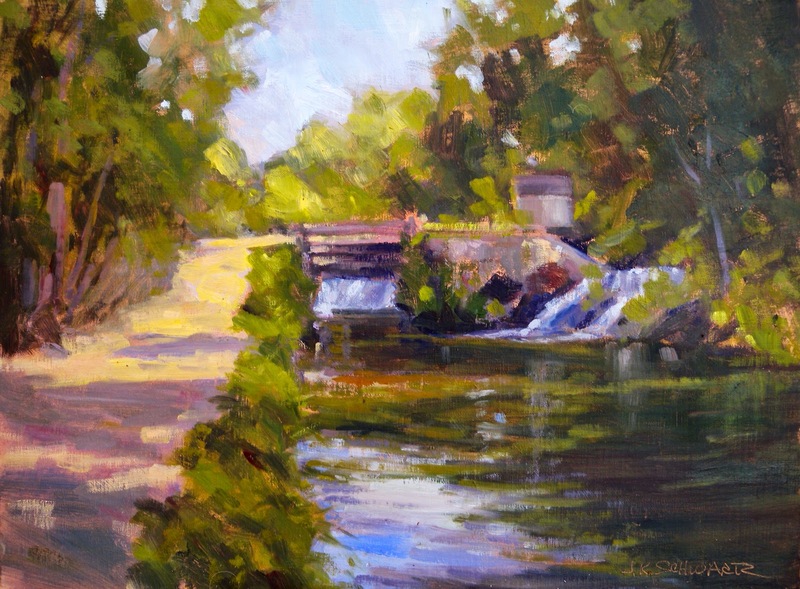 "Timeless Traditions, Today's Landscapes" at Black Rock Center for the Arts in Germantown, MD. October 8th through November 1st. More information about those will follow in future posts. I mentioned in my last post that I hadn't been out painting as much as I usually am at this time of year and was spending a lot of time on cityscapes painted in my studio. Sure, I have been out with my sketchbooks but not with my full plein air gear. Last Sunday I was! I joined fellow members of The Washington Society of Landscape Painters at Great Falls Park in Maryland. In spite of the ominous forecast a large number of us showed up and we were glad we did as we were treated to a beautiful, sunny morning with a soothing breeze. I paint very often in Great Falls Park on the Virginia side and this was my first outing in the same park on the opposite side of the Potomac. Magnificent views of both the falls and the C&O Canal! I had a hard time deciding what to paint but the comfort of this spot won out. I was in the shade enjoying the breeze and the sound of the falls and the water rushing through the lock. Heaven! It is definitely time to get back to more plein air painting! The color in this photo is somewhat over saturated. For instance in the original the yellow of the path is more Naples Yellow than Cadmium which is to say more golden in hue. This is the painting as I finished it on Sunday and I will be making some minor adjustments. It is a keeper and I will be framing it for sale. On the easel in the studio right now is a new cityscape of Pennsylvania Avenue after an evening rain shower. It is almost finished so it will probably be my next post. There are a lot of shows coming up this fall and I want to have plenty of paintings to choose from. The first exhibit will be in October at Black Rock Center for the Arts in Gaithersburg Maryland. I'll give more show information in a later post.